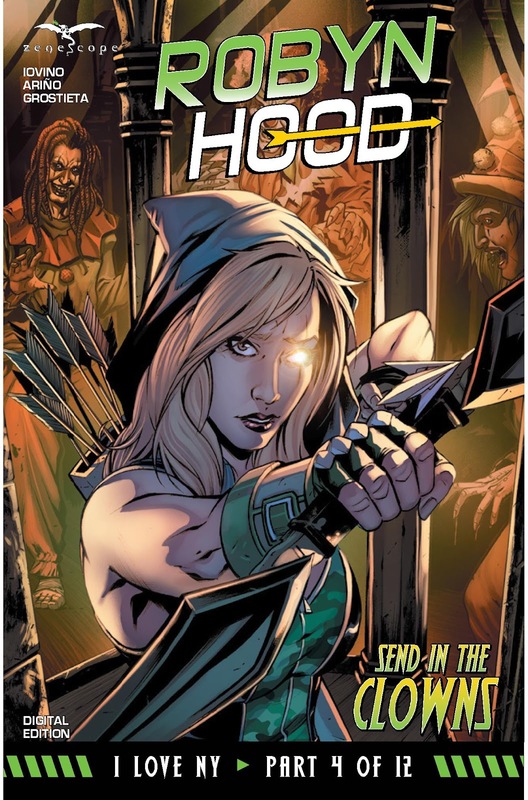 The Fellowship has obtained a first look at ROBYN HOOD: I LOVE NY #4 from Zenescope Entertainment. The issue, which hits stores September 21st, is written by Lou Iovino; drawn by Sergio Arino, Riveiro, and Milton Estevam; colored by Grostieta and Jorge Corts; and lettered by Taylor Esposito. Robyn has always been a champion for the weak and innocent. So when kids start disappearing all over New York, Robyn embarks on a cross-city manhunt to find the predators responsible. But she never counted on their floppy shoes, water-squirting flowers and red rubber noses. The action swirls like a carnival tune when foes from Wonderland invade Manhattan in the latest chapter of Robyn Hood: I Love New York.